NYC-based fashion brand Public School presented its Spring 2016 collection at New York Fashion Week. 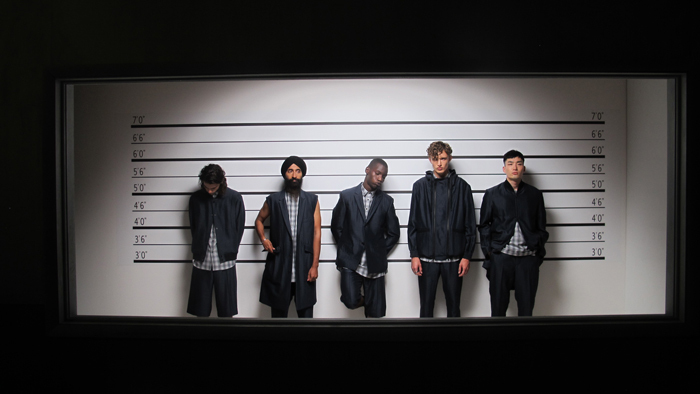 Based on the color platette navy, black and white and its classic silhouette such as ankle-high pocket shorts, the two NY-born and raised designers Dao-Yi Chow and Maxwell Osborne created another collection that can be styled up or down and worn by different groups of people. The brand set up mock two-way mirrors, which is a recreation of a prison “lineup”. NBA starts such Dwyane Wade, Nick Young, and celebrities Joe Jonas, Darren Criss showed up in the presentation. And what should be more noted is that some iconic faces in the fashion industry such Nick Wooster, Waris Ahluwalia and George Lewis Jr. were also standing among the models as “suspects” waiting to be recognized. Undoubtedly, this new collection is one of highest anticipated presentations during the first New York Fashion Week Men’s. And this time, Public School wasn’t trying to break through the “upscale-athleisure” aesthetic, which has been dominating the menswear for a few years. The seemingly slow but steady steps that the brand is taking might just be enough for it to be one of the most representative New York fashion houses in the booming menswear industry.